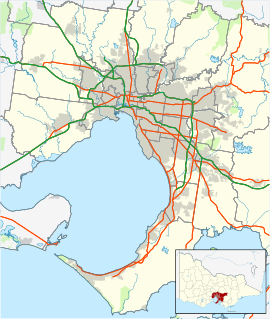 Keysborough is a suburb in Melbourne, Victoria, Australia, 27 km south-east of Melbourne's central business district. Its local government area is the City of Greater Dandenong. Keysborough was named after the Keys family who founded the town sometime after 1878. At the 2016 census, Keysborough had a population of 25,785. Keysborough includes market gardens and semi-rural properties and is also a large residential/industrial suburb which started to grow in the 1960s and well into the 1990s. The Post Office opened on 27 November 1973 and was known as Noble Park South until 1978. Today, Keysborough facilitates several primary and secondary schools, including the Keysborough campus of Haileybury College and Lighthouse Christian College. Parkmore Shopping Centre includes a Coles, Woolworths, Kmart, Big W, Australia Post and an assortment of specialty stores. As of 2002 the southern corner of the suburb was under development and new housing estates have been developed including The Keys, Hidden Grove, and Crystal Waters. In 2017, Elmswood and Somerfield are new housing estates in southern Keysborough currently under development. In 2014 Keysborough had an estimated population of approximately 22,800. This suburb features lower levels of migrant settlement and cultural diversity, higher levels of English proficiency, substantially greater incomes and lower rates of early school leaving, than Greater Dandenong. The 2011 Census found that 53% of Keysborough residents were born overseas, slightly lower than for Greater Dandenong (60%) though more than the corresponding metropolitan percentage (33%). Among the 93 birthplaces of its residents were Vietnam (accounting for 10%), Cambodia (7%), India (4%) and Sri Lanka (4%). Rates of migrant settlement are relatively low, with 3% of Keysborough residents having arrived in Australia within the previous 2.5 years – less than half the figure for Greater Dandenong, of 7%. Languages other than English are spoken by 59% of residents – compared with 64% for Greater Dandenong. Twelve per cent of Keysborough residents have limited fluency in the use of spoken English, less than the municipal level of 14% though three times the metropolitan level of 4%. Among the major religious faiths are Buddhism, adhered to by 22% of residents, Islam (6%) and Hinduism (3%). Nine per cent of young adults (20-24 years) had left school before completing year 11 – lower than the municipal average of 13% and the metropolitan level, of 10% Median individual gross incomes of $482 p.w. recorded in the Census, are the highest in Greater Dandenong and over four-fifths (81%) of metropolitan levels. Of the 6,130 homes in Keysborough, just 1.5% are flats, far lower than the proportion across Greater Dandenong of 21%, or the metropolitan level of 11%. Eighty-four per cent of homes in the suburb are owned or being purchased by their occupants – higher than the metropolitan level of 71%. Keysborough is home to several schools and educational facilities. The Chandler Park (which are Chandler primary school and Maralinga Primary school merged) name was made from Putting Chandler and Maralinga Park. Keysborough Park and Maralinga primary schools and Keysborough Secondary College - Acacia Campus are located within the suburb's boundaries, while Wallarano Primary School and Keysborough Secondary College - Banksia Campus are just beyond its northern boundary and have catchment areas which include parts of Keysborough. The Resurrection Catholic Primary School is also located in Keysborough on Corrigan road. On Springvale Road, the suburb's western boundary, is the Keysborough campus of Haileybury College, which is co-educational and includes Newlands, a preparatory school. The Assemblies of God-run Lighthouse Christian College. The Keysborough campus of the Turkish-run independent community school Sirius College, and Mount Hira College, are other private schools in the area. Keysborough is serviced by buses operated by Grenda's Bus Services and Moorabbin Transit. These buses can be hailed from Parkmore Shopping Centre, while the SmartBus has to be hailed from Springvale Road. There are several parks and shopping centres in the vicinity of Keysborough. The major shopping centre located in Keysborough is Parkmore Shopping Centre, which is operated by GPT (General Property Trust). Approximately six buses run through this shopping centre. Football - Parkmore Football club offers Australian Rules Football. The town has an Australian Rules football team competing in the Mornington Peninsula Nepean Football League. It is also the location of Gaelic Park, home of the Victorian GAA for Hurling and Gaelic Football and this is the only facility owned by an association outside Ireland. Football (soccer) - Keysborough Soccer Club based at Coomoora Reserve competes in Football Federation Victoria Provisional League Division 2 South-East and Parkmore Soccer Club, near the new Hidden Grove estate, competes in Football Federation Victoria Metropolitan League Division South-East. Basketball - Keysborough is also represented in basketball at a state level by the Keysborough Cougars. The Cougars have a number of junior sides and a team in the Big V.
Golf - Golfers play at the course of the Keysborough Golf Club on Hutton Road, or at the course of the Southern Golf Club on Lower Dandenong Road in neighbouring Braeside. Other - Keysborough is also the home of the Victorian Dodgeball Association, whose annual event "Dodge Day Afternoon" is held at Springers Leisure Centre, just off Cheltenham Road, each October. Horse riding lessons and horse agistment (paddocks for hire) are available in Keysborough and the nearby suburb of Bangholme. ^ a b Australian Bureau of Statistics (27 June 2017). "Keysborough (State Suburb)". 2016 Census QuickStats. Retrieved 3 December 2017. ^ Victoria, corporatename=Parliament of. "Parliament of Victoria - People in Parliament". www.parliament.vic.gov.au. Retrieved 17 August 2017. ^ "Keysborough | Victorian Places". www.victorianplaces.com.au. Retrieved 17 August 2017. This page was last edited on 14 April 2019, at 12:01 (UTC).